A plantation over 200 years old. "You feel as though you are actually stepping back in time when you enter the grounds of Melrose. You immediately sense the architectural, cultural and historic fabric of the place and for a brief period of time can become detached or removed from the outside world," said Natchitoches Community Leader Sharon Gahagan. Yes, when you are over 200 years old, you have many stories to tell. And, so Melrose Plantation does. And in publications around the country they have been told and retold, for, as Gahagan points out, it is an intriguing, enchanting and enticing place. And it is now owned by Association for the Preservation of Historic Natchitoches. Its mission is to protect and preserve the plantation and to keep it alive with all the stories it holds. It runs Melrose as a house museum. So what makes this place so very special it draws visitors and journalists from around the world? The people do, of course. The stories start with a recent controversy brought about by a scholarly publication. It deals with Marie-Therese Coincoin, for many years heralded, with some of her children, as founder of Melrsoe. Legend has it that Marie-Therese Coincoin, a freed slave, and her children started Melrose with a land grant. Recent historical research calls this into question. "No documents are known to support Marie-Therese Coincoin's ownership of the property ... Scholars today doubt Marie-Therese even traveled to the property," says the book "Economics and Authenticity: A Collision of Interpretations in Cane River National Heritage Area, Louisiana." It is by David W. Morgan, director, Southeast Archeological Center National Park., Tallahassee, Fla.; Kevin C. MacDonald; and Fiona J. L. Handley. The paper does say that she lived on and ran a farm nearby and her son owned the land and worked the property now called Melrose. "This is based on solid research and is as close to fact as one can get," said former Shreveporter Art Shiver, who, with Tommy Whitehead, wrote "Clementine Hunter: Her Life and Art." And, there is Cammie Henry who moved to Melrose in 1897 with her husband J.H. Henry. J.H. died in 1918, but Cammie stayed on for 30 years. Famous for starting an artist's retreat, she welcomed all who came as long as they had a project to work on. "Others worthy of note are Clarence John Laughlin, the Louisiana surrealist, and the famous photographer Doris Ulmann. I would add (New York Times writer) Craig Claiborne ... Francois Mignon gave him a Clementine Hunter quilt which hung in his bedroom until he died in 2000," said Shiver. Melrose is the tale of writer Mignon, who came for dinner and stayed 30 years and became a good friend of artist Clementine Hunter. And Melrose has the story of the internationally recognized memory painter Hunter, who portrayed life in the first half of the 20th century as she knew it on Cane River. Hunter's story starts at Melrose where she was a cook and house servant who served Miss Cammie's guests, writers and painters. She tended the flower and vegetable gardens at Melrose, pointed out the Shiver/Whitehead book. "These life experiences at Melrose became the major themes in her work," according to the book. Hunter celebrated her 100th birthday at Melrose, March 16, 1986 with good friends Tommy Whitehead and the late Ann Brittain helping her blow out the candles on the elaborate birthday cake. She died Jan. 1, 1987. Those who loved her gathered for her funeral at St. Augustin Catholic Church, Isle Breville, as a snow storm blew in. New Facilities Manager Molly Dickerson, who fell in love with Melrose three years ago when she came from West Virginia for an interview is also now part of the history. She and her husband Jonathan live here now. Among Dickerson's contributions to the stories? She applied for the African House's National Treasure status. Melrose's lore includes its buildings, beginning with the first, Yucca House. Among others: Melrose's Big House; a log cabin, referred to as the Writer's Cabin; the Bindery; and Clementine Hunter's House. •Cammie Henry bedroom. Features things that belonged to her, including a blouse, photo when she graduated from what is now Northwestern State University. •Cammie Henry's "guest book." A white tablecloth. When guests came to dinner at Melrose she asked them to sign the tablecloth, which she later embroidered and so had a permanent record of who had been to dinner in her house. •The library where Cammie Henry created scrapbooks. She put together 265 of them during her life, using them to document the history and the Melrose community. Her scrapbooks were bound in the bindery, now the Museum gift shop. •Copy of "Bird Talk" by Caroline Dormon, a naturalist and preservationist who did research at Melrose. Tommy Whitehead pointed out that Melrose is always evolving. Something interesting is always happening here. And, there is usually a party, a gathering to celebrate it. Recently the National Trust for Historic Preservation named The African House a National Treasure. Last week, Whitehead met with National Park Service and Melrose officials to discuss the preservation and interpretation of the Clementine Hunter House where the painter lived and sold her paintings from 1953 until 1977 when it was moved to Melrose. Before that, Hunter had lived about a mile away. The historic plantation means different things to different people who love and care for this place, pointed out Whitehead. •Whitehead: "It was Clementine Hunter's environment for her paintings." •APHN President Vicki Parrish, who has been APHN president off and on for seven years, and with help from committee chairwomen oversees the running of the plantation: "Strong women. What brought me here was Marie-Therese ... The legacy. Determination. Persistence, Self-reliance. She depended on herself. I admire her tremendously." •Alma Alost, involved in APHN for more than 20 years and recording secretary for 14 years: "When I walk on the grounds of Melrose I am humbled by experiencing 200 years of plantation history. Melrose represents the preservation of hard work and lessons learned from the past. Also I am proud of efforts made by preservationists to protect the unique learning environment for future generations." •Bill Stanton, Melrose groundskeeper since 2007: "It is a singularly unique place. ... Mine is a magical job. When (facilities manager) Molly (Dickerson) and I sit on the gallery of Melrose overlooking the place, we think it is one of the most wonderful places in the world to work. Just before dusk as the light shifts, there is a yellow spectrum. The grass becomes a bright green. There is a golden glow. It is brief. It is dead quiet. You hear the wind and the trees. And you can almost hear people laughing." •Arlene Gould, executive director Natchitoches Convention and Visitors Bureau: "Its history, the culture and the stories this wonderful plantation offers." •Museum Gift Shop Manager Betty Metoyer-Roque, an admirer of Marie- Therese: "It is special coming to Melrose. It is so relaxing to me ... And if weren't for APHN, it would not be here for generations to see. It is important for generations now to see it." •Natchitoches community leader Sharon Gahagan: "We never get tired of visiting Melrose because it is not just a historic plantation house. A trip to Melrose allows you to take a journey back in time and become a true part of history. It has been designated as a National Historic Landmark by the U.S. Department of the Interior-National Park Service just like Mount Vernon." The plantation's stories, of course, continue. The plantation is the story of strong women. Buildings which survived the passage of time. Preservation. Restoration. And the story of real people who made it their home. As Gahagan muses: "Think about Cammie Henry weaving. Lyle Saxon and Francois Mignon writing. And, Clementine Hunter painting scenes of everyday life on Cane River." Think about them as you walk it grounds, hear its history. Today, the National Trust for Historic Preservation named African House, located at Melrose Plantation in Natchitoches, Louisiana, a National Treasure. Unique in its structure and unknown purpose, the building is also home to world-renowned folk artist Clementine Hunter’s murals. Melrose Plantation was established in 1796 by former slave Louis Metoyer, a free person of color. In the 1820’s, Metoyer commissioned his enslaved workers to construct the house however, no records exist that give an exact date of its construction, original purpose or explain its unusual design which reflects the style of traditional architecture of houses in Africa. Today, the two-story hut-like building stands threatened by deterioration and destabilization. 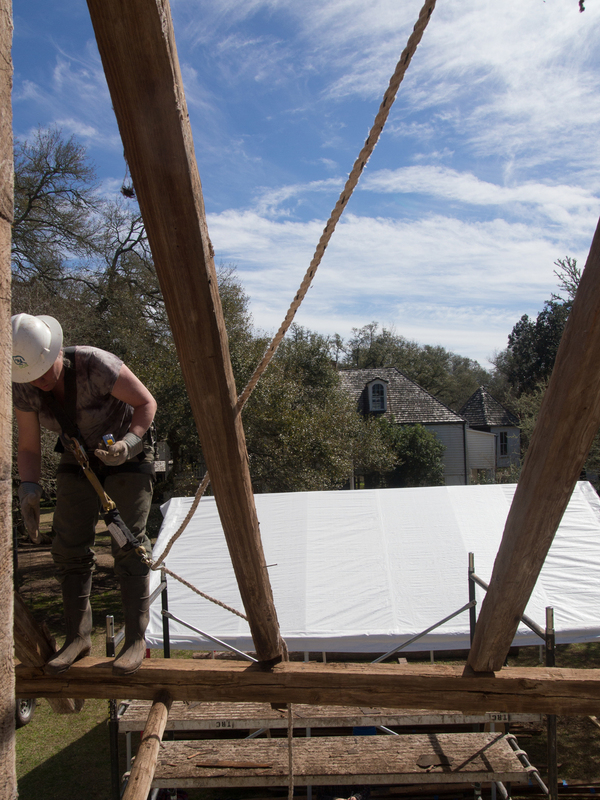 Preservation of the brick masonry walls and roof structure are needed to ensure the site is protected and reopened for public tours as an important part of the story of Melrose Plantation. In naming the African House a National Treasure, the National Trust is committed to supporting the site’s restoration. The National Trust’s HOPE Crew (“Hands-on Preservation Experience” Crew) will address repair needs on the roof and other exteriors. HOPE Crew is an initiative of the National Trust that trains thousands of crew members in useful historic preservation skills. “African House speaks for generations of hard working individuals through its massive hand hewn cypress beams and handmade bricks,” said Vicki Parrish, president of the Association for the Preservation of Historic Natchitoches which owns and operates Melrose Plantation. Further enhancing the historical significance of African House are nine murals by folk artist Clementine Hunter. 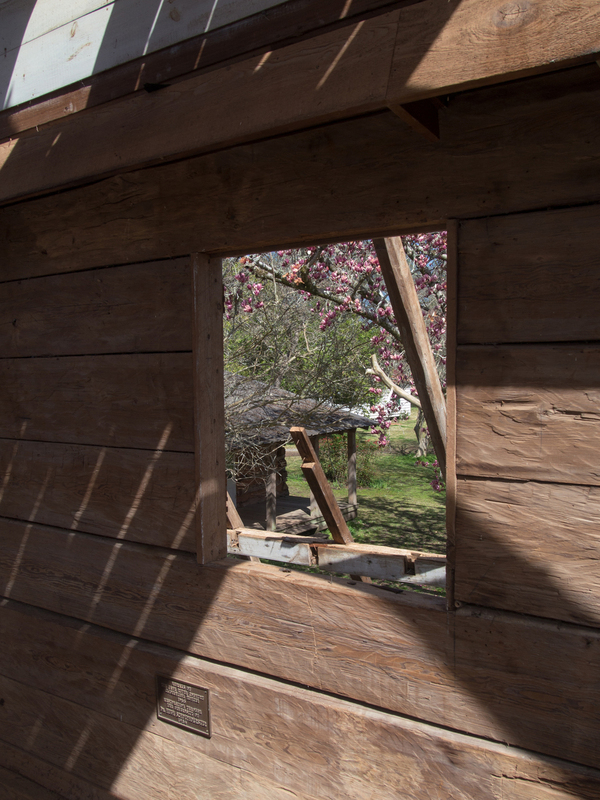 Painted in oil on plywood and installed on the building’s interior walls, the murals depict early 20th century landscapes and scenes of daily life at the plantation. As a farm-hand at Melrose Plantation, Hunter began painting in the 1930s when she was in her 50s. She created more than 4,000 paintings over four decades, drawing national acclaim and exhibits in galleries across the country. Today, Hunter’s works are sought after by collectors. The African House murals have been conserved and will be returned to African House when the building’s restoration is completed. Thanks to Yael Textor for assisting with on-site photography.